Gillian Joseph was one of two winners for the 2018-2019 Knapp Fellowship Award. Her research project, Find Our Women, began with Gillian talking to women who were survivors, and family members of Indigenous women that are missing, murdered or victims of violence. She did this work within her honors thesis research and wanted to find protective factors for these Indigenous women. She began looking at the Dakota Access Pipeline camp, and concluded that decolonizing a space/society is a protective factor for violence against Indigenous women. To learn more about Gillian’s early phases of the research project, and her inspirations for the project read this article! After one year of Gillian’s groundbreaking community-based research, she was published in the APA journal through an internship at the American Psychological Association. 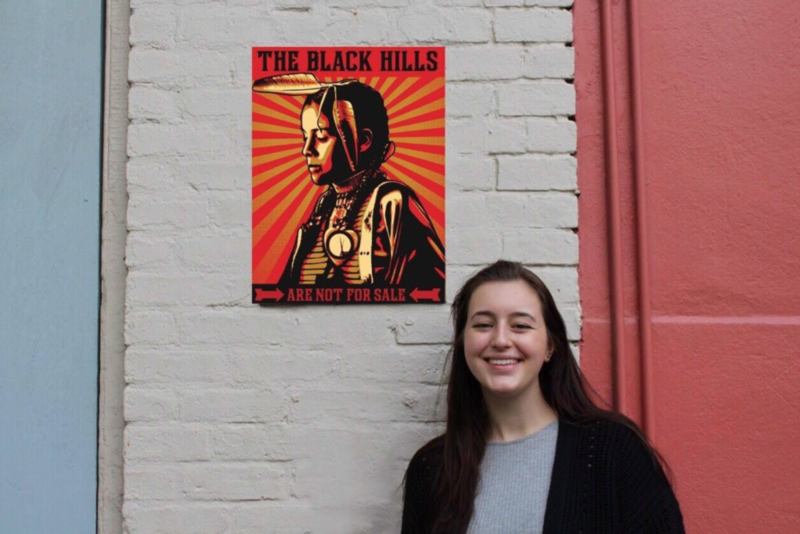 She focused on Native American issues and met a Native American psychologist, who helped her publish a paper about the intersection of psychology and violence against women. She also has another article under review in the Journal of Indigenous Research . Gillian is creating a non-profit organization, Project Find Our Women, which gives money to Indigenous women to tell stories from their communities that aren’t being seen or heard so that other women can relate, and reach out if they are feeling the same violence or treatment. Learn more about Project Find Our Women here. Gillian is graduating from GW and will get her master degree through a program called Erasmus Mundus, which is a program through the EU and fully funded. She will focus on cross-cultural psychology. She wants to continue her work and extend it to other Indigenous populations. She also wants to expand her non-profit and tell different stories. Gillian has done excellent work, her progress in a year is just amazing. Nashman is so proud of Gillian, and we're excited to see what her future holds! Our November faculty spotlight is Nashman affiliate faculty, Dr. Maranda C. Ward from GW's School of Medicine and Health Sciences (SMHS). She is currently teaching two Nashman designated Community-Engaged Scholarship courses. One is an online course where she serves as the course director and has integrated IRB-approved research funded by the GW SMHS Center for Faculty Excellence, HSCI 2110: Disease Prevention and Health Promotion. The other is funded by a Nashman course development grant, HSCI 2195: Applied Health Equity. Nashman's Community-Engaged Scholar, Emebte Atanaw, sat down with Dr. Ward to ask about her role as an Nashman affiliate faculty and her newest course offering. Former Knapp Fellow and GSHED Alumna Dr. Maranda Ward in the News! Her research is translated into practice as the Co-Founder and Executive Director of Promising Futures. In her blog, she takes you on a bus ride from an affluent part of town replete with healthy and abundant food options and services, to her neighborhood, where residents struggle to even meet their most basic needs. She uses these examples to engage students in understanding structural inequity. We are so proud of the outgoing Knapp Fellows as was President Knapp! 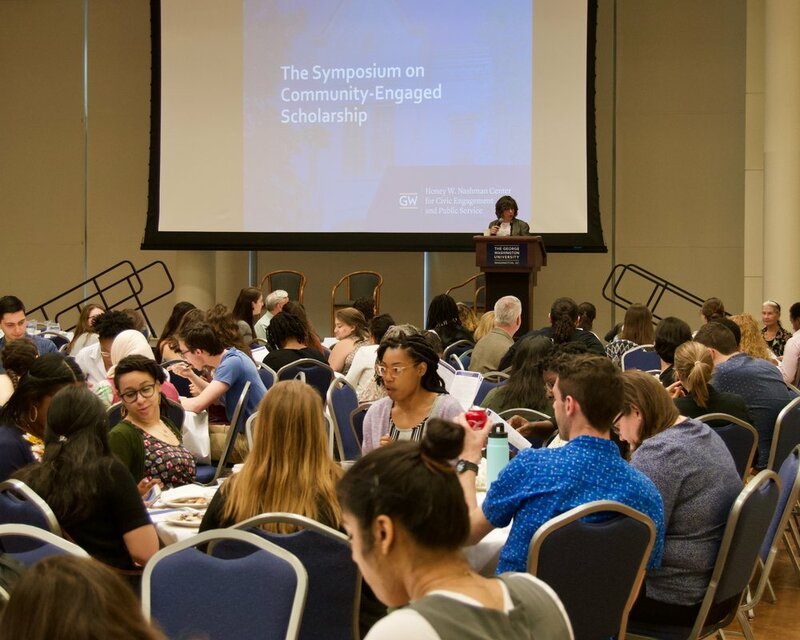 The Spring 2018 Symposium on Community Engaged Scholarship included presentations from students in the Law School, Graduate School of Education and Human Development, Columbian College, Milken School of Public Health and GW Nursing School. Breakout sessions highlighted student work in University Writing, Spanish, Human Service Social Justice and History courses in addition to work done by GW Nashman Center in on Ethics of Service, GW School of Business innovations projects and the work of Knapp Fellow Chloe King on Food Waste in DC Public Schools. 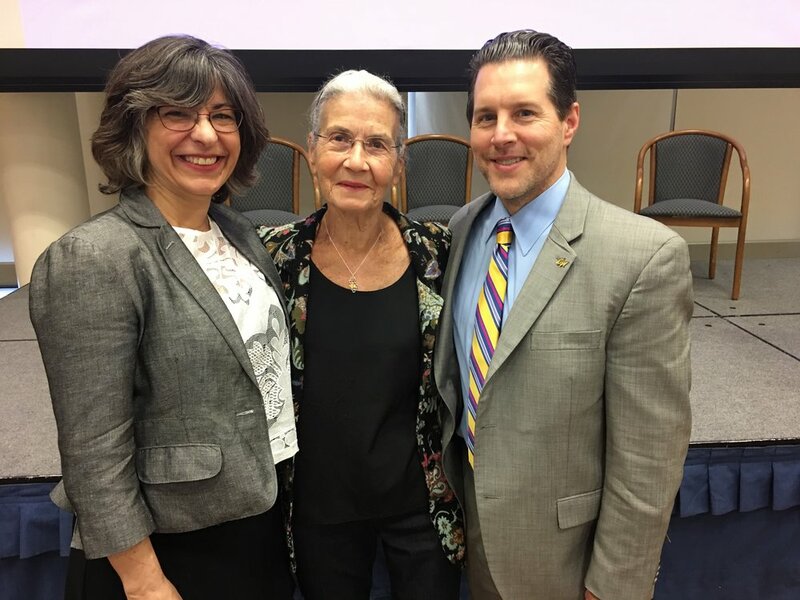 New Knapp Fellows Kristen McInerney and Gillian Joseph were announced at the event and Peter Konwerski was awarded the Faculty Engagement Award by Honey Nashman. The poster session encompassed scholarship from students and faculty in every corner of campus and across a wide variety of disciplines. There were over 88 student presenters and the full program can be found here. Thanks to everyone for sharing your community engaged scholarship! Kristen McInerney is one of two Knapp Fellowship winners for the 2018-2019 school year. Community Engaged Scholar Ashley Hidalgo sat down to discuss Kristen's project with her. Tell me about your project and how you believe/hope that your scholarship will impact the community you are doing research with? Kristen McInerney (KM): My research project, stems from my experience with English Learners (ELs) who struggled or are struggling in our traditional high school models and I formerly worked at a few different high schools with a growing EL population. My belief is that our current high schools are not set up for English Learners, and that inspired me to apply to this Graduate School of Education and Human Development Doctoral program in Curriculum and Instruction, to see how we can improve the outcomes for ELs. With my research I hope to gather data, that we don’t typically gather upon enrollment of a student, and use it to predict and analyze student outcomes, such as grades and graduation. I am also interested in Resilience Theory and how that relates to my students’ experience in high school. This scholarship will directly impact the immigrant students that I work with and their families and bring the community together. Daily I work with bright, strong, multi-lingual, independent, and inspiring international students who deserve to graduate just like their native English-speaking peers. AH: That is truly inspiring. What kinds of research methods/methodologies will your research use? I know it was mentioned earlier, but could you elaborate on how these methods bring the community into your work? KM: My Research Project is my dissertation idea, which is a mixed-methods, explanatory sequential case study, which is beginning with the quantitative data piece to inform qualitative data collection to gain a richer understanding of my students experiences in hopes to tailor programming and policies for English learners. To build community partnerships, I would like to partner with Art Therapists, possibly GW's Art department, to build a mosaic or puzzle mural within our school and share with the wider community. Each student and staff member would create a piece, then it would be combined into a beautiful mosaic, where every single piece is valued and holds an important part in our community. Students will create their design focusing on their identity, the theme of resilience, and what success means for them. AH: These forms of data collection will be very impactful for students. Why do you think it is important for student researchers (and researchers in general) to incorporate members of the community into research? KM: Partnerships with the community are incredibly important especially with my population of students as English learners, and really all students. When you think about supporting the whole child and their family, whether they are here or in their home country, it is important to foster a new welcoming home. I think that community partnerships and community participatory action research is really important because the community has a sense of shared ownership, vision, and call to action. AH: Do you have a favorite researcher/community scholar/activist who inspires you? If so, would you share a quote from them (or a book or article they wrote)? KM: I have been re-reading the LISA Study by Suarez-Orozco, Suarez-Orozco, and Todorova who did a 5 year longitudinal study of immigrant youth in American high schools. They state in their conclusion, “Immigrant-origin youth come with big dreams and their initial boundless energies and optimism offer a great, if untapped, National resource.” I see that everyday in my students, their energy, their smiles, their excitement, and alongside their tears, and other concerns, and sadness. There is so much potential and strength and assets that our students have, like said if untapped or should be tapped, it is certainly a wealth of knowledge. And to be bilingual or trilingual there are so many things that our students can do and I want to give them the tools and opportunity to do so. AH: What a great quote! You could have chosen many different ways to do your research-why involve the community? What do you think it adds to the research by doing this? KM: I believe that my research holds more meaning and it is more empowering when it involves the community. Just like the school that I work in, the staff as a whole has a common passion goal, and drive Also, the more awareness we can draw to a problem, the more potential solutions we can find. And the greater the call to action and greater impact can happen. AH: Do you anticipate working with any community partners (non-profits, other scholars, students here at GW other students or public institutions (schools, hospitals etc. ), in this research? KM: Yes, I definitely am reaching out to people who are involved with Art Therapy and other forms of social work and dealing with trauma. I know that GW has an Art Therapy program, so I am hoping to build a partnership with them, but I really think that developing partnerships especially for our students will really be able to help us able to reach them and provide the best experience possible in our school. AH: Is there anything you’d like to say to Former GW President and Mrs. Knapp for funding the Fellowship? KM: Yes, it is an incredible honor and I would want to first say thank you for believing in my students. They are the reason why we do what we do, and for them to recognize my student population as valuable and worthy, of having one of the best experiences possible in our high schools, that goes a long way trusting and for believing in me. Thank you for seeing ahead, and funding something that is a big passion of mine and for helping me make a difference in my community. It is truly a humbling opportunity and I have a lot of work to do on the project but I would say thank you for believing in me. Bianca Trinidad is a Community Engaged Scholar with the Nashman Center. She sat down to talk with Gillian Joseph one of two winners of the 2018-2019 Knapp Fellowship Award. Bianca: Tell me about your project. Gillian: So, I named my project, Find Our Women, but the purpose of it is to provide an answer to the unanswered - to give part of a solution to the missing and murdered indigenous women crisis that’s going on in the U.S. and also in Canada, but the U.S. has no public inquiry into it, whereas Canada does. So, there’s really been nothing done formally to help indigenous women that have been going missing and being killed in the U.S.
My project revolves around creating a website and also a mobile application for phones, because a huge problem is how information flows between police networks and reservations, because a lot of times they’re really rural and isolated. My project is trying to make it easier for women and the families of women to report when they’re missing or something is wrong. And to have a formal database. You see, indigenous women don’t have their own database and they’re not always registered under a federal missing persons database. So, that’s really important to actually have data on, because there is no true data on indigenous women going missing. A lot of the data is collected from community members that are like “My aunt is still missing” or “My sister is still missing”. So, that’s the biggest part of it. The website will have all the resources needed on it and a lot of facts and statistics. There’s no one place that you can go to to get facts and stats, and so, I’m hoping that my website would make it easier for indigenous women to have resources they need, such as hotline numbers or other websites that will be useful to them. Any information that needs to go to them will be on the website and also, just for the general public to have a place to go, because I feel like it’s hard to get people to pay attention, and it’s really hard if you tell them about it, and they have to Google search for about half an hour in order to find anything. So hopefully, it will make it easier to raise awareness. The last part of my project is getting firsthand accounts and stories of families of missing women and survivors that have gone missing or have had experience with domestic violence and for them to be able to share their stories about it. This collection of stories will be posted on the website, and accessible to the public. I feel like a lot of times, people care more when they hear a firsthand account. I feel like it’s hard to understand what is actually going on. A lot of people don’t know anything about it - which is expected. It’s not really publicized. So getting traction behind it and showing indigenous voices, instead of talking over them. Bianca: So, what inspired you to take on this kind of project? Gillian: I’m actually part Dakota. My dad is Dakota, my mom is white. So, my dad is from South Dakota, and I actually spent last summer living on the Cheyenne Reservation in South Dakota, and culturally, it is really important to protect women, because women are considered sacred in a lot of Dakota tribes and also in general Native culture. I’ve heard stories from my dad, and it’s been going on since my dad was a kid and before then. And my friends; and just like knowing that women I’m related to or are in the same tribe or tribal nation as me are going missing is - it’s a lot to think about, because it’s not always in your mind. But when you have that attachment to it, it is. So I would talk to my dad about it a lot and to other people. I have a really awesome mentor. My faculty advisor here; she is also a Native woman. So talking to her about it and to other Native women really helped me decide that it wasn’t enough for me to just talk about it. But instead, I need to actually offer what I thought could maybe help. We’ll see if it does! I think it will! Bianca: I definitely think it will. Okay, so how do you hope this fellowship will affect the community you are doing research with? Gillian: So, I truly hope that it will give at least the native communities, well I would be focusing more on the Dakotas, just because that’s where I have a relational tie to. But I’m hoping that it will really give indigenous women a voice in this nation, because a lot of times I see people talking about MMIW (Missing and Murdered Indigenous Women), but never mention actual women, and so, they just turn into an epidemic and not people. So, it dehumanizes them in a way. And so, that would be really effective, and also having this data from the database collected and giving indigenous women a way to have to report their family and their friends, and just having that power, which is a basic human right. Having that will hopefully: a) create awareness for the community and have people take it more seriously and b) eventually get the government to help officially recognize that. Bianca: So what kinds of research methods will your research use and how do these methods bring the community into your work? Gillian: I think a lot of times people think about research in a very different way than Native culture and communities do. So, when you go to an actual tribe or community in a reservation, and hand out surveys, they would be like “what are you talking about?”. It wouldn’t translate very well. But a really big value with research and doing research, in a way that Native people do, is a lot of discussion. I’ll be going to South Dakota and will talk to tribal elders, members and of course, women to try to understand what they think they need and what they want to see out of it, because that’s the best way to do research: to have those kinds of big round table discussions. For quantitative research, the database will definitely be a big part of that, and it will be directly from indigenous communities. I’ll be able to look at that data and see what’s happening. A lot of times, people report to police officers or they’re reported online, like people post about it on Facebook groups and stuff. So, that data will be collected from those sites and will be put into one place, so that you can actually find it. Bianca: Why do you think it is important for student researchers or researchers in general to incorporate members of the community into research? Gillian: So, sometimes it is the difference between helping someone and helping provide the resources to help someone. So, this idea of not talking over people and not implementing something onto the community, but with the community. Especially with Native communities, there’s a long history of people who try to help in a way that is more along the lines of white saviorship than actual help. So, I think when you integrate people from a community into your project, you’re actually helping the community more, because you’re putting their voices first; you’re understanding more about what they actually need and not what you think they need. Bianca: I agree. So next question, do you have a favorite researcher, community scholar, or activist who inspires you? Gillian: Hmm, that’s a really good question. I never really thought about that. I don’t know. I’m always really impressed by other Native American women; like regardless of who they are and what they’re doing. Whenever I see them being really active, whether it’s helping their community in general or the broader Native community or general public, it’s always so awesome to see that. You know, it’s inspiring. A lot of times, I think I never see Native women in a public space, so that’s really cool; like Winona Laduke, she’s a Native activist. In general, native women inspire me. Bianca: You could’ve chosen several different ways to do your research, so why involve the community? Gillian: Native values and that cultural understanding of putting their voices first are really important to me. I don’t want to talk over anyone, because it should be coming from the survivors and their families, and from the women’s ideas and voices. Bianca: So, do you anticipate working with any community partners in this research? Gillian: I haven’t formally signed on with any community partners. In the future, possibly. There’s not a huge amount of Native American Women-specific organizations. I can only think of one: The National Indigenous Women's Resource Center, and I’ve talked to them a little. We haven’t formally agreed to anything. I’m sure that there will be other organizations that will be able to help me, or at least help me with resources and guidance. The community is really awesome. I feel like if you ask a question, people will be able to answer it. Bianca: Okay, so last but not least, is there anything you’d like to say to the Former GW President and Mrs. Knapp for funding the fellowship? Gillian: Thank you so much! When I heard the news that I won the fellowship, I called my dad and we were both crying, because there’s just nothing that addresses what indigenous women go through and how important Native American women are. So yeah, that’s kind of cool to know that this fellowship is funding something that should’ve been funded long ago, and I’m glad that I can be that person to help get it through and who helped get it funded. So, thank you. Bianca: Congratulations once again! I think that what you are doing is incredible and super inspiring. Learn about the work that GW VISTAs are undertaking with DC Public Schools and some of the challenges around mentoring, food insecurity, technology, immigration and racial justice that DCPS students encounter as the negotiate their educational progress. 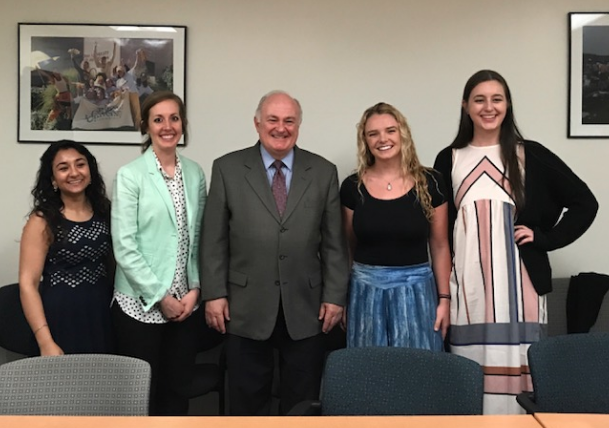 Learn about how direct service can serve as a pathway to engaged citizenship from students who have completed service projects in classes this year at GW. We will discuss the possibilities and limitations of this approach with panelists. We will be discussing and handing out information about the Knapp Fellowship in this session. The 2018 applications are due on January 12 - please join us for this session if you are interested in applying! Learn about work that students in the Civic House program are proposing, featuring new GW partnerships to address issues such as food insecurity in DC, LGBTQ+ civil rights, urban gardening, and homelessness. Students engaged through coursework in Spanish 3040 and through Operación Impacto and Chávez~Huerta 2018 will present their work, vision and experiences. The Campaigning for Change award will be introduced as part of a call to action during this session. While all are welcome to attend, this session will be conducted in Spanish. Presenters: Students in the Human Services and Social Justice program present findings and recommendations from their research study on Senior Wellbeing to staff from the DC Office on Aging. The Eco Equity Challenge provides students with funding to implement a project that brings together sustainability and social justice to make a real impact in communities in the District. Join this workshop to explore the concept of environmental justice and begin to develop your own idea for a project with the guidance of our staff. Applications for the Eco Equity Challenge are accepted through February 16, 2018. Chloe King is a Knapp Fellow working to reduce food waste in DC schools, partnering with the World Wildlife Fund, where she interned last year. She is also co-founder and president of GW Scuba Club and studied abroad in Indonesia. Aleena Khan, a service-learning scholar here at the Nashman Center, spoke to Chloe about her compelling project and her experience as a Knapp Fellow. Aleena: Can you briefly describe your project? Chloe: Last year, I was interning for the World Wildlife Fund (WWF) in the fall of 2016 on their Food Waste Team – so I when I initially started, I was thinking, “How on earth does food waste relate to wildlife?” and that was normally a big question that people have when they hear about the WWF and the Food Waste Team. Why do they have that team? Food and agricultural production are one of the biggest threats to wildlife on the planet, and at the same time, we’re wasting 38-40% of the food that we produce for consumption. It’s a massive problem, and one that I learned more about throughout the course of my internship there. My boss, Pete Pearson, was wonderful; he just said – partially because he was stressed by so many projects – to just pick whatever I want, and that I’ll manage it. So, I picked schools – they’ve always wanted to start a project in schools – so I started developing a curriculum. I’ve developed a lesson plan, PowerPoints, educational posters, activities, things like that for an age range of 5th grade and up that’s really adjustable. I worked for them for that whole fall semester and were finalizing all those materials and other work as well that the team was doing. I then went abroad last year, from January until August, for 7 months, so I was not involved with food waste for a while. When I was away, I heard about the Knapp Fellowship and I applied for it with the aim of working with the WWF when I got back. I knew that, regardless of whether or not I would have gotten [the Fellowship] that I wanted to work with the WWF again, since I wanted to complete what I had already done. This big push this time around was to do it really locally and utilize the fact that the headquarters were here. There’s a lot of people in the office that have experience doing these kinds of food waste audits, and essentially being able to go into schools and helping them perform the food waste audits. At this point now, it’s really been about getting the approval of the people in DC, like the Department of General Services, DC Public Works, DCPS and the bureaucracy there, the Organization of Superintendent Schools and Education (OSSE). That’s essentially what’s been going on so far, with the project. The plan, ultimately, is to get a lot of feedback from teachers this year when we’re actually doing the audits in the lunchroom and teaching kids about food waste so we can put this all on our website and have teachers all over the nation collecting data about food waste audits in their schools and collecting donations as well and getting that to food banks and people that need it. A: What is the process of partner acquisition? C: It’s been a little bit difficult and part of the reason that I love working with WWF so much is that it’s a really respected organization within the conservation space and also within the education space – kids sort of grow up looking at the Panda calendars. It’s a really good networking device to use, which is why I’ve enjoyed working with them. Typically, I’ll reach out to them and say, “Hi, my name is Chloe and I’m from the WWF Food Waste Team; this a project that we’re working on, how can we help you?” Ultimately, what we’re trying to do is to give schools the resources to pursue this and have it be as simple as possible for them to take on. Initially, I thought that I would just reach out to a principal and they would be interested and that would be it, but it’s been way more complicated than that. It’s mostly been about getting a really interested parent or teacher that are already engaged in stuff like this. A lot of the schools I’ve already talked to have school gardens or have been doing an environmental curriculum previously. In terms of reaching out to the local government, that’s been fairly easy because there’s been a lot of initiatives in DC in regards to food waste. Councilman Mary Shay, for Ward 3, has been really big into food waste initiatives, so she’s been helping us with networking and getting approval because we can’t just walk into a public school and start something. That’s also been a big barrier that I hadn’t quite been aware of; we’ve had to get approval from all these different agencies before we could even begin any curriculum work. But, we’ve gotten all the approval we need and have sort of sent out information and have set a soft deadline of November 1st. A: How has the Knapp Fellowship aided with your project? C: The WWF does have a lot of resources, but at the same time, it is a large organization. Having a certain amount of money that I can use separate from WWF that I can really use to fulfill a need is really nice. Transportation costs become really expensive, since I’m taking the metro back and forth between sites, so it’s also helped with that. I’m ideally hoping to use the money to hire other students that have interest in this. I gave a presentation on food waste in my climate change and policy class and asked everyone at the end that if they’re interested or know how to do audits, then I could pay them or give them a $50 gift card for doing it and a lot of people were interested in doing it. I have a good friend who interned for the WWF’s Food Waste Team this past summer, so I’m going to try to have her help me as well. That’s all what I’m probably going to use the money for. Also, if schools need any materials, such as buckets, scales, sorting materials, I could buy them those supplies. It’s just nice to know that I have this funding available to actually pursue the project, because if I was just doing it on my own, it would be really difficult. A: How has your project personally impacted you? C: I’ve always been interested in the food system and how it’s worked – I’ve been a vegetarian since I was ten – but I never understood how big of an issue food waste was until I started working at WWF. I think that itself has been a really big learning experience for me, kind of learning about the other side of the food system. I think the biggest impact is going to be seeing children learn; I cannot tell you how many hours I’ve spent developing this lesson plan, and it’s going to be so nice to see it out there and to see students learn it as well as getting that immediate feedback from teachers. A: What advice would you give to someone who’s unsure about applying for the Knapp Fellowship or is unsure if their idea is developed enough to apply for the Fellowship? C: I think I myself applied to it literally a week before the deadline. I was thinking more and more about it and realized that it would be so helpful in aiding what I wanted to do. Even at that point, I didn’t really have much of a concrete project, but it was really helpful that I had interned at WWF before and knew it was something that I wanted to go back to. So, I would recommend for anyone who wants to apply for the Fellowship to have an organization in mind. In my experience so far with developing this project, having the resources, people, and team at the WWF that I can talk to about this has been critical to this project. Even if you don’t have a direct connection to an organization, try to foster a relationship with them. All these organizations are trying to do the same thing, and you have the unique opportunity to be the one who unites them all towards a single project, which I think it really cool to do with a student. The Knapp Fellowship for Entrepreneurial Service-Learning makes it possible for exceptional GW students to combine scholarship with action and change the world. Prizes of up to $10,000 will be given out to student-led service projects.